“Will it be in black and white?” asked one teenage boy to his parents as we all queued to see STAN AND OLLIE. Judging from overheard conversations, he was just one of many who were about to have their introduction to the boys. It’s lovely that there were potential new fans in the audience; I crossed my fingers and hoped that the film would be up to the challenge. Sure enough, STAN AND OLLIE gets much pathos out of the boys’ waning years, but that pathos is genuine, and there’s a lot of warmth too. And, in the end, the decision to focus on later years makes sense as the tours were where their friendship really formed a special bond. It’s a bittersweet little film that really does come from a place of love and respect. Let’s get this straight, though; it is not a documentary. I can live with that. I don’t really care that they rolled tours that took place in 1947, 1952 and 1953 into one, that they might have swapped Morecambe for Worthing or added some small events that didn’t happen . Most of the attention to detail is astounding, and the essence of the boys’ situation is preserved, but this is storytelling, after all. Along the way, some of the supporting characters find themselves rather caricatured. The domineering and squabbling Ida Laurel and Lucille Hardy or the sleazily conning Bernard Delfont are slightly unfair portrayals, but are comically done and add a good dose of humour. I was glad that, as the film went on, the wives were allowed to become more three-dimensional in their relationships to the boys and each other. I have more trouble with the portrayal of Hal Roach as a stereotypical Hollywood bully. While undoubtedly he held the boys’ contracts to his advantage, he wasn’t the villain he’s portrayed as. I suppose the point of the brief prologue is to set up how the boys got to their 50s situation, but it’s still rather unfair. The other bit that sticks out like a sore thumb is the infamous scene where the boys argue over Babe’s appearing without Stan in ZENOBIA. While I’m sure the team probably did have at least the odd, brief cross word in thirty years, the scene just doesn’t ring true. In fact, it plays exactly like what it is: a scripted attempt to make a moment of conflict and convenient soundbite for the trailer. Still, the fact that the worst fight the script writers could conjure involves no shouting and no bad language perhaps just goes to show how deep the two men’s friendship was. At least it’s over soon and quickly forgotten. The fact that that the gentle love between Stan and Babe shines through in all of this is a credit to the performances. Steve Coogan and John C Reilly had a hell of a job to pull off such recognisable, loved characters, as well as their offstage personas. In my opinion, they do a terrific job on both counts. The makeup makes them real ringers for the real-life men, and they get the voices down very well indeed. There’s just the right mixture of regret and good humour in their acting, and Coogan does an excellent job of conveying Stan’s gentle air of English repression. As far as the onstage personas, Laurel’s abstract vagueness is always slightly harder to convey than Babe’s precise mannerisms. Coogan grasps the importance of Stan’s eyebrows, and generally gets his flailing movements right, if not quite 100%. A reprise of COUNTY HOSPITAL on-stage is a blast, and as the two do a double door routine in long shot, I really had to remind myself that I wasn’t watching the genuine article. It’s a new variation of an L & H routine, not an exact copy, but feels totally authentic. It’s such attention to detail that really makes the film a joy. I particularly liked the little touches of 50s culture sprinkled through: the queen’s coronation, a skiffle band or a poster for ABBOTT & COSTELLO GO TO MARS, reminding us how far society had changed. The fact that Laurel and Hardy still made people laugh in the atomic age, so far from Model Ts and sunny California streets, reminds us why they are special, and still funny. If you asked me for a deep reason of why I love Laurel and Hardy beyond just laughing at them, I’d reply that their films, however unintentionally, speak deep truths about humanity, and the nature of friendship and love. The best compliment I can give STAN AND OLLIE is that it conveys much of the same. A very Happy New Year to you! Yes, I’m still here… I’ve spent most of 2018 working on a few non-film projects, but The Lost Laugh is returning with a new issue very soon. I’m just in the proofreading stages now so expect to have it finished within a fortnight. It’ll be mailed to subscribers, and available to download from here shortly afterwards. Silent film accompanist, historian and DVD producer Ben Model has produced some wonderful releases over the last few years, highlighting forgotten comics such as Marcel Perez, Monty Banks and Johnny Hines. 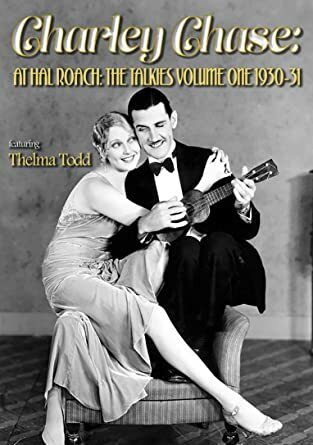 Now he’s just announced his next Kickstarter project: some prime works from wonderful but forgotten comedienne Alice Howell. Alice was a big star in the late teens and early 20s; she was one of the few women permitted to be funny in her own right in the male-dominated world of screen comedy. Her image was quite unique; piled-up frizzy red hair and a permanently surprised expression made look rather like a manic doll. With her scatty but carefree working girl was an ancestor to Lucile Ball. You can read more on her here. Sadly, all but a few of her films have been lost, and many of those only exist forgotten in archives. This release hopes to free some from the vaults of the Library of Congress. A worthy project indeed, and one I’ll certainly be backing. Here’s the info direct from Ben’s page, and the link below. “This Kickstarter will fund a project that brings 6 extremely rare Alice Howell silent comedy shorts to DVD, made from 1915-1925, selected by me (Ben Model) and by silent comedy film historian Steve Massa. 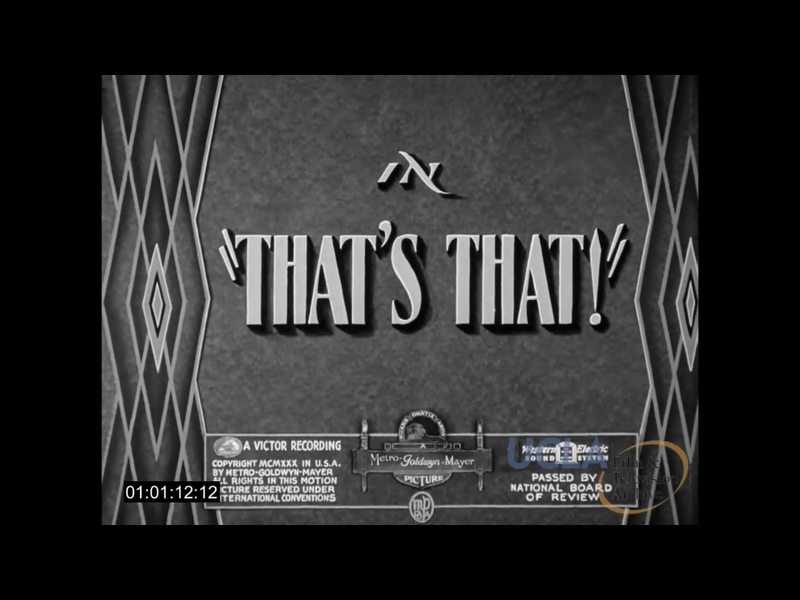 The films that will be on the DVD will be seen in new digital scans of archival 35mm and 16mm materials preserved by the Library of Congress, and will be scanned by the Library of Congress’ lab. I will create a brand new custom musical score for each film. All of the films will require exposure adjustments and some may need new intertitles or main titles. The DVD box art will be created by professional graphic designer and silent era aficionado Marlene Weisman. The DVDs will be professionally authored and they will be made available for sale on Amazon.com, as I have been doing using successfully for 18 of my DVD releases, and will be publicized. This Kickstarter covers all costs for the DVD’s production and release, as well as of the making of and shipping of backer DVDs. Jordan had access to all sorts of outtakes, bloopers and sound effects in the Roach vaults, and used them to cobble together a bizarre little stream-of-consciousness short, replete with non-sequitirs, random effects, animations and amusing juxtapositions ending up like something Spike Milligan would have been proud of! 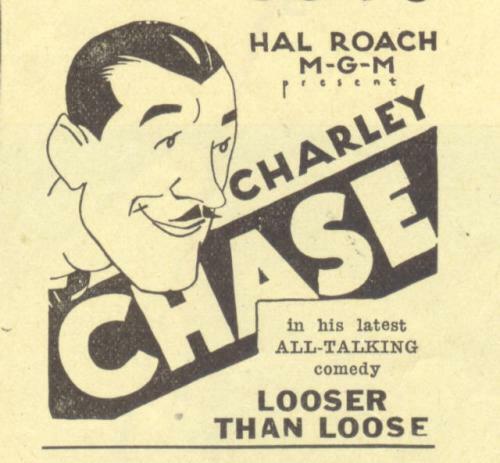 It begins with full Roach titles; THAT’S THAT was the original working title for THE LAUREL-HARDY MURDER CASE. Alternate takes from MURDER CASE form a large part of the footage, along with its Spanish language counterpart NOCHE DE DUENDES. There are also chunks of OUR WIFE, LAUGHING GRAVY, DIRTY WORK and the then-current WAY OUT WEST. Outtakes from the latter include a shot of Tiny Sandford in costume (replaced by Stanley Fields in the finished version) and Stan’s double Ham Kinsey reciting the declaration of independence! 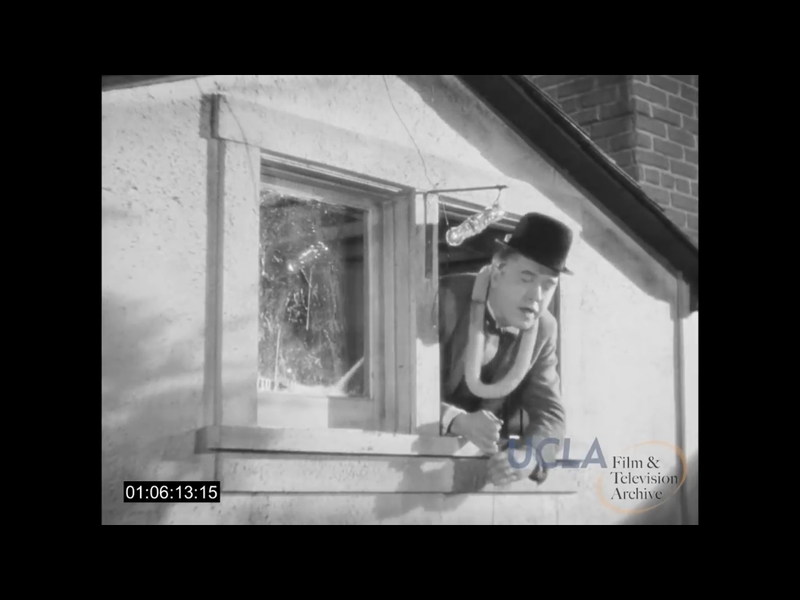 L & H co-star Charley Chase makes an appearance, messing up a scene from MANHATTAN MONKEY BUSINESS and cursing; Edgar Kennedy provides a wrap-up comment for the short. There are also glimpses of Mae Busch, Jimmy Finlayson, Charlie Hall, Babe London and Gordon Douglas. Most interesting of all is a very brief deleted gag from SONS IN THE DESERT, from the attic scene. Stan is attempting to pull something on a string up to the attic, but manages to get it caught on a radio set, which falls over and explodes. It’s always a pleasure to hear Buster Keaton speak. That deep and rasping voice so full of life and stories. Here he has a genuine audience in interviewer Fletcher Markle, who seems fascinated by him, and has at least read his autobiography. The interview takes place at Buster’s ‘ranch’ home, and there are some nice shots of him and Eleanor at home in the garden. Some of Keaton’s answers ramble away from the question a bit, but they are always entertaining, and he seems engaged in the conversation. There are some chunks missing here and there, so occasionally the subject of conversation changes abruptly. Overall, this is a fascinating document though. What wouldn’t you give to be a fly on the wall…?